For a while we’ve been in contact with Aventus, a school in the Stedendriehoek region. With a choice of over 230 courses, the school has around 10.500 students and course participants and roughly 1.000 employees. The institute has 11 locations primarily in Apeldoorn, Deventer and Zutphen. 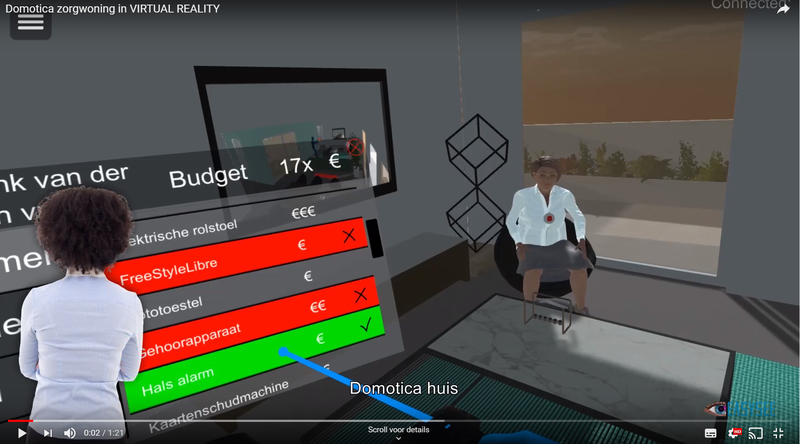 For the school in Apeldoorn we are developing a domotics care house in VR. Domotics in healthcare is in full development and the school wants to take part in this innovation. Aventus wants to keep students up-to-date when it comes to new knowledge. The virtual domotics care house is a new form of teaching that the school is happy to offer to students. The video down below will explain what you can expect from such a virtual care home. We can report that students are very enthusiastic about this new way of teaching. Learning from a book is slowly being replaced by tablets but we want to go a step further. An interactive learning method which separates you from your surroundings gives you the same focus and information as a textbook. The difference is that the student can remember information a lot better in this interactive way. In Virtual Reality you must have a proactive attitude to properly finish the tasks. In addition, updates in virtual Reality are quick and easy to implement. This is therefore much easier to achieve than to purchase all the domotics.